Smart Acid is a new generation of blended feed acidifier developed by Sunrise R&D in cooperation with B.A.S.F. The years` study introduces the formulation of [organic acids complex combined with calcium salts " to form a conjugating system: instead of just lowering PH, Smart Acid is able to adjust gastric PH to a certain level to ensure an optimum digestive ability. 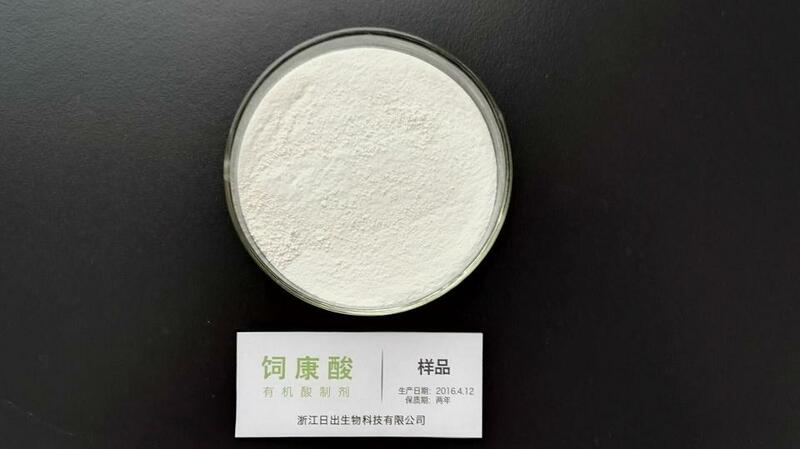 The improved formulation is less corrosive, safer to use and easier to handle than pure organic acids. 1.Improve feed intake and weight gain. 2.Reduce intestinal disorders from E.Coli, Salmonella etc. 4.Good palatability, no pungent smell. 6.Lower dosage than single acid type. 7.Provide with a certain source of calcium, to reduce the use of limestone, thus to lower the ABC (acid binding capacity)of feed. 8.Prolong preservation period of feed. 9.Safe for handling, no corrosion to feed devices. 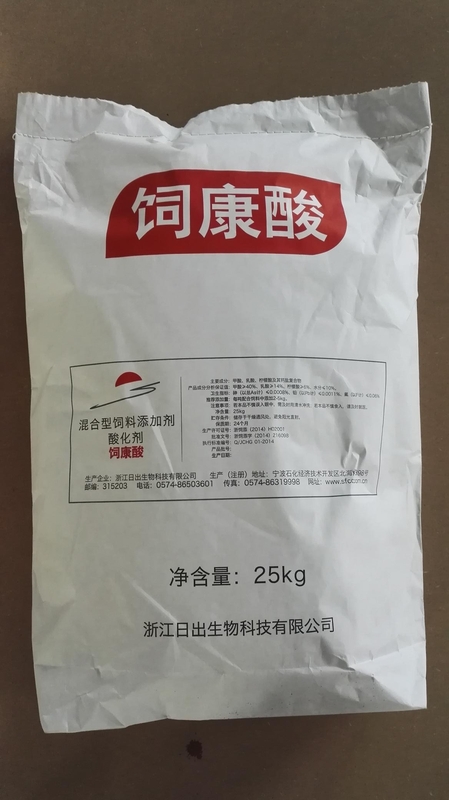 With the help of great buffering capacity of organic acid and organic acid salt complex, the gastric PH level of animals can be adjusted to around 4 ,which will ensure an optimum digestibility. In addition, multiplication of probiotics and microflora in the gastro-intestinal tract can benefit from low pH value. Organic acids with low molecule weight can easily penetrate the microbial cell walls of gram-negative bacteria such as E. coli and Salmonella. Then it inhibits multiplication of pathogen germs by releasing acid radical ion and hydrogen ion, which impedes the synthesis of DNA and consumes amounts of energy respectively. As the critical intermediate of energy metabolism, citric acid and lactic acid are involved in TCA and gluconeogenesis respectively. By decreasing buffering capacity of diet, organic calcium can partly replace the limestone to lower the buffering capacity of daily diet..
1. Packing: N.W.25kg/Bag or according to customer requirement. 2. Storage: Store in cool and dry place, avoid direct exposure to the sun and rain. Shelf Life:2 Years. 3. Transportation: Transport as non-hazardous material. Looking for ideal Formic Acid Type Feed Acidifier Manufacturer & supplier ? We have a wide selection at great prices to help you get creative. All the Antibacterial Feed Acidifier are quality guaranteed. We are China Origin Factory of Feed Acidifier for Swine and Poultry. If you have any question, please feel free to contact us.